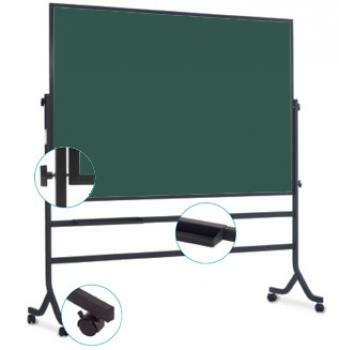 Double-Sided Standing Chalkboard on Wheels. This reversible chalkboard is constructed of Porcelain Enameled Steel. Porcelain Enameled Steel is magnetic, resists scratching and fading, and is guaranteed my the manufacturer for 50 years. The heavy-duty chalkboard rotates 360 degrees on a powder coated steel stand. The chalkboard locks securely into position. The rolling chalkboard stand sits on locking casters, for added mobility. Choose your size and chalkboard stand color. A convenient, wide chalkboard accessory tray is included.